The idea of being chipped has too “much negative connotation” today, but by 2067 “we will have been desensitized by the social stigma,” Munster says. For now, Three Square Market, or 32M, hasn’t offered concrete benefits for getting chipped beyond badge and log-on stats. Munster says it was a “PR stunt” for the company to get attention to its product and it certainly succeeded, getting the small start-up air play on CBS, NBC and ABC, and generating headlines worldwide. The company, which sells corporate cafeteria kiosks designed to replace vending machines, would like the kiosks to handle cashless transactions. The benefits don't stop there. In the future, consumers could zip through airport scanners sans passport or drivers license; open doors; start cars; and operate home automation systems. All of it, if the technology pans out, with the simple wave of a hand. The embedded chip is not a GPS tracker, which is what many critics initially feared. 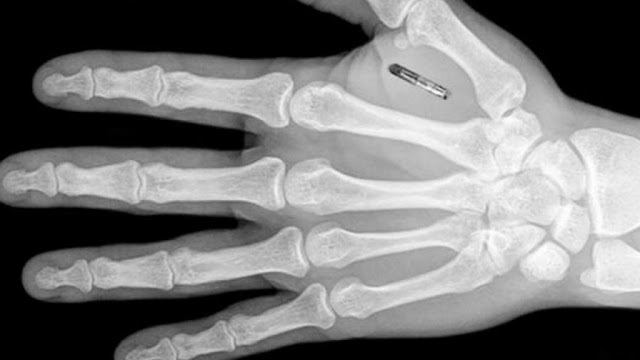 However, analysts believe future chips will track our every move. For example, pets for years have been embedded with chips to store their name and owner contact. Indeed, 32M isn’t the first company to embed chips in employees. In 2001, Applied Digital Solutions installed the “VeriChip” to access medical records but the company eventually changed hands and stopped selling the chip in 2010. But after what we saw in Wisconsin last week, what's next for the U.S. workforce? A nation of workers chipping into their pods at Federal Express, General Electric, IBM, Microsoft and other top corporations? Several states have passed similar laws, while one state recently saw a similar bill die in committee. "I see this as a worker's rights issue," says Nevada state Sen. Becky Harris (R), who isn't giving up. "This is the wrong place to be moving," she says. “You’ve got to have a lot of trust to put one of those in your body,” Grayson says. Workers will need assurances the chip is healthy, can't be hacked, and its information is private, he says. Meanwhile, religious advocates have taken to social media to express their displeasure about chipping, flooding 32M’s Facebook page with comments like “boycott,” “completely unnecessary” and “deplorable.” On 32M’s Google page, Amy Cosari a minister in Hager City, Wisc., urges employees to remove the chip. Ten years ago, employees didn’t look at corporate e-mail over the weekend. Now they we do, “whether we like it or not,” he says. Be it wearable technology or an embedded chip, the always on-always connected chip is going to be part of our lives, she says.